Your compliments mean a lot! Thanks to everyone for the kind words. Great idea. As 1990exr and 1990[H]accordex are saying they're are a few around. Be cool to have a meet in Truro. So weird, a few weeks ago I thought I was the only cb7 enthusiast around these parts. Even after the meet with 1990[H]accordex I've got some ideas I want to do to my ride now (door tweeters, dye seats), so it would be great to see other enthusiasts! I wonder, if we could get 10 to show up for a meet I'd be impressed! Truro sounds like a great place for a meet! The last NS thread appears to have been shut down because it was created in the wrong place. I think I have every cb7 in this town memorized for their location. 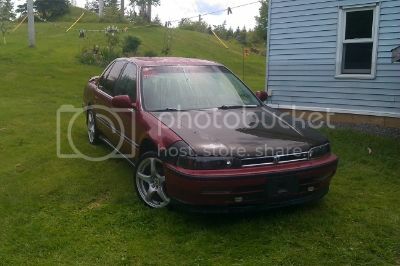 For years I've always check out this one accord in town as it was in amazing shape and rarely moved. As I was driving today I glanced in and my jaw dropped when I seen a for sale sign on it! eeeeek, as I slammed on the brakes and turned around. I didn't care who lived there, I pulled in the yard and got out to check it out. I was smiling from ear to ear. Turns out its a 91 exr. 216,000km and ONE owner. An older fella and his wife owned it. They never drove it hard, they always fixed what was broken. They were gentle on it and it showed. It had very little surface rust and everything was original. It had these plastic light covers (covering the headlights) which I've never seen before. The surface rust was on the wheel wells, and it was undercoated. New gas tank and muffler on it. It had grey interior and the only thing broken was the antenna. It still had the tape deck in it, a automatic with a F22, auto-start remote, and original shocks. The older fella and I stood and talked in the driveway for about 30min about the car and its history. & now (although I can't afford it), I WANT IT! I want it so bad! But the guy is trying to get $3000 for it, which is too much. I may try to save up some $ and see what he says to a lowball offer. ..... all I can think about it "how can i get that car, how can i get that car, how can I get that car" haha. I think I'm going to become obsessed with getting this car for my daily driver. I'm regretting now having some money saved up for something like this. I too, could not wait till the day came when it was for sale! I think I've been looking at this car for 5 years or more every time I drove by it. I think he's trying to get some of the $ he put into it back by having a steep price. He hinted a lot that his wife was making him sell it as they just got a new Pontiac Vibe. haha. Check out the 2nd pic with the headlight covers. 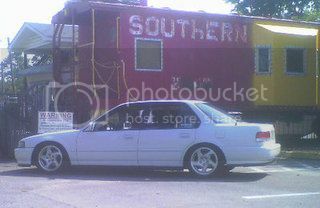 & stretch JDM, by clean, I'm not talking Arizona clean, but its as clean as you get around these parts. So what do you guys think its worth? 1500 to 2 grand, because it's minty clean, one owner and fully serviced. I paid $1400 for my base LX coupe with 172k, one owner. I wouldn't worry, nobody is going to shell out 3k for that thing, so it'll sit, and sit, and sit, until you come up with some money. A little while ago in town here, there was a 91 EX-R for sale, with like an original 42 000km... yes forty two thousand. They wanted like 7 grand for it and i was like trolololololol srsly? Does it have a good MVI? I bought my EX-R coupe for $2000... similar condition to what you described, 225,000k and MVI good for a year and a half when I bought it. From what I've seen, it's hard to find something in good shape with a good MVI for less than $1500 around here. 42,000km , wow! prob worth a good 5K, just because you can't find cb7s with 42,000km on them anymore. This one did have an inspection until april 2014, so that's a plus. I'm going to wait on it for a bit as he has my #. I'm sure he won't go lower than 2K, but I was thinking of offering him a little above his asking price, something like $1700. I think he realizes the sentimental value of the car also. A coworker had a very mint black cb7 and was offered 3k at the car wash and that's US. Take that accord to cali and you would get 3k easy. If it's clean enough there are people who will pay for a well maintained car. There are people who will sell cheap, there are people who will buy high for a car that needs no work, so good luck on the buy. He might get someone offering him 2500$ before you know it and his wife makes him take that. I know a lot of us tuners need our deals, but I know there are people who get more than we can pay or did pay for something similar. & you're right. He's originally from Boston so I'm pretty sure he knows this too. 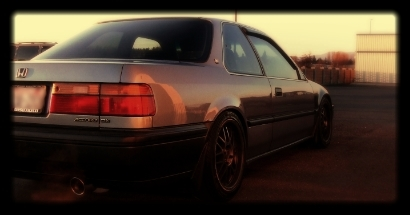 He knows that most will want a deal, but he also knows that someone out there will pay 3K for this "rare" cb7 that's in good shape because they love the car. Personally I'm hoping he calls me in two weeks and gives me a deal I cannot refuse on it, but I doubt it. Ya, that's correct. Mini D2S 3.0" Projectors. I have so much reading to do now. Need to figure out what parts I need, how to mount, and what the heck is that wire for. Can't wait! Mainly too, what headlamps to put these in. My initial thoughts were to retrofit the ebay one piecers but now that I have them i think they deserve a better headlamp than those ebay POS things. So I think I'm going to put them in the current headlamps; USDM yellow high beam ones I'm rocking now. NICE!!! Those projectors are gonna be awesome. You won't regret them at all! And those red/black leads are for the shield solenoid. If you get a pair of high-beam splitters from TRS you can just plug them into your stock harness. That way the shields will drop when you turn on your high-beams...and you still get to keep the stock high-beams as well. Nice! I have had some g35 ones for a while I need to figure out as well. I think even usdm stock are cleaner than current eBay projectors. Good luck with the install! I'm so excited. But from what I can tell I still need to order shrouds, some nice Philips bulbs (as my current 9006 HIDs wont fit), and balasts. But I can also get an adapter kit for my current balasts... Maybe. I have some reading to do; loving it! I'm also thinking of finding a pair of JDM one piece housings to put these in. I was thinking of selling these eBay one piecers. Funny thing is that now on eBay the price for these things have gone up. I found one seller who wanted $114 and all the other sellers wanted $260. Rofl. Who would pay that much for these, lol. Yeah there is a local shop asking 100$ new but they have gone up on eBay. See I have the same issue, mine came with the Philips bulbs and eBay kits are for non d2s headlights. Someone told me to get an eBay kit but didn't give me details on the socket so that's my biggest issue.